British born Canadian actor best known for playing Dr Rodney McKay on tv series Stargate Atlantis. In film he can be seen in Cube, Splice and Rise of the Planet of the Apes. I met him at a Massive Events Stargate Convention. David had Nike Shox that day, which were near 0.6 inch thicker than my sneakers, Jenny saw him at LFCC 2014. I initially thought 5'10 flat for this guy, but I see that he has just over half an inch footwear advantage over Rob. So, anything from 5'9.5 to 5'9 5/8s seems plausible for him. Definitely a weak 5'10, I would edge this guy out a little. Good listing always liked his style very memorable. Usually average look kinda lanky when younger but still average height. I could buy this listing when I compare him to Jenny! Rob.. Are you looked up to him as 176.5 (exactly 5'9.5) or more strong 177cm low ? Editor Rob: well he wasn't really over 5ft 10 up close and had a significant footwear advantage, so around 5ft 9.5 at most I'd have said, 176 and change. 5'10" in the morning, 5'9.25"-5'9.5" genuine height. IMDb lists him 5'9". He's shorter than many main characters and guest stars on Stargate but never really looked short himself. Has the rare quality of not looking under average at this height despite being stocky. 5'10" guy based on those pics. My photo at the same convention as Jenny, real cool fellow. Great pic with Jenny. Looks 5'9. good listing. what does he claim? 5'10? Yes but it could be giving Lee the advantage. Anyway if you watch the movie right when Moore arrives on the island there's solid 20 mins where Moore and Lee walk together. Would you agree Moore was 6'1 and Lee a tad over 6'4? Most scenes Lee has the 3 inches on Moore.but if Moore was 6'0.5 then Lee could never be a solid 6'4. its hardly more than the difference here..
Looks about 5'10.5" here, but since his shoes are about 1/2" thicker, he's probably 5'10" flat. He looks 5'10'' here but the listing is fine because he had thicker footwear. More 1.76m to me. Looks seldom taller then Paul McGillon on screen, who Rob has listed at 1.74m. Rob, what shoes were you each wearing? He looks taller than just 1 1/2 inch taller than you. Morning height is not your correct height, neither is your evening height as both of these you are only for max a few hours. Correct height is the height you are for the large proportion of the day. rob do you think 5'9 flat is possible? [Editor Rob: in sg1 when he first appeared with amanda tapping he looked pretty close in height, whether he had thinner shoes is harder to tell. I would have def said 5'10 but 5'9.5 would be right with the shoe advantage. Rob: I think the reason why some of these posted heights on Celebheights differs from other websites, e.g i-m-b-d - is because you choose to post your night-height which is caused by gravity. You should know that our height in the morning is our correct one(the doctors are usually measuring in the morning on little kids and for an example on regular medical examinations). These errors normally occurs on determinations on photos of celebs that you're standing next to. I'm not talking about the height right of bed, but probably like 1-2 hours after. I am mysql 6'0 feet in the morning 1-2 hours after bed, and around 5'11.75 in night. You might wanna consider this - Celebheights is a good website afterall. This guy on 5'10 for sure !!! he is a bit taller than Mc Gillion(weak 174cm) and clearly towered by Flanigan( 182cm) so 175-176 cm sounds good for him. In season 1 of SG Atlantis they made Joe Flanigan look clearly taller than everyone else in the pics, but starting season 2 David and Rainbow didn't seem that much shorter than him anymore, plus Joe sometimes looks really shorter than Jason Momoa, maybe that's just because Jay has a relatively strong build. David Hewlett is 5'10 1/2" tall. He's not tall, but he looks taller on Atlantis because he's stacked up against Alpha Male Joe Flanigan who clocks in @ 5'11" rather than RDA who is 6'2". Also if you're comparing him to the women, Amanda's 5'9" (SG-1's lead actress) where Rachel's 5'4" (Atlantis' lead actress). SG-1 just has a taller cast than most any other TV show. Even near 6'1" Ben Browder said that he looks short in some shots on SG-1. 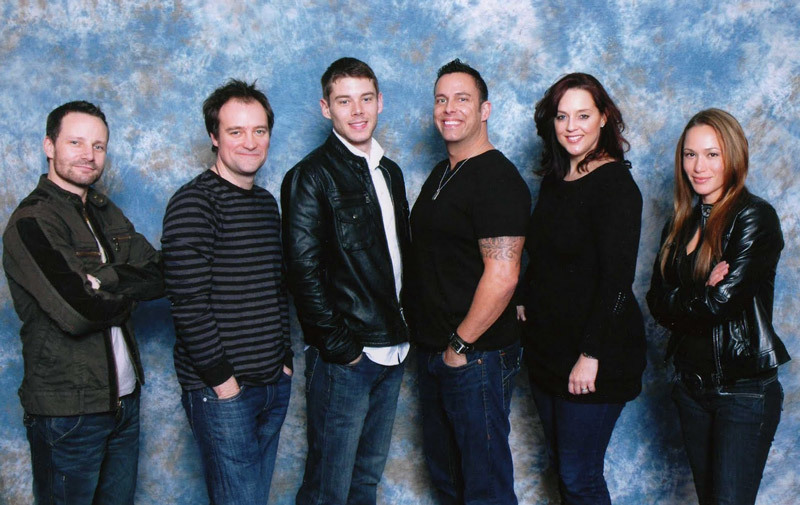 Corin Nemec (Jonas) who claims to be 6'1" said he "disappears" amongst the rest of SG-1, including Amanda Tapping. Amanda herself says people who have only seen her on SG-1 and meet her in real life tell her "oh, you look like Amanda Tapping, but you're way too tall." It's interesting to note the rather extreme difference seen early on in the stargate seasons (season 5 or 6) where he makes guest appearances, compared to his stargate atlantis figure. You can obviously tell that he's quite short, even shorter than Samantha Carter. 5'7-5'8 is most likely accurate, with boosts added in stargate atlantis. After all, they wouldn't purposefully try to make him look shorter earlier on. Oh dear. Of all this site, not one height debate from you insecure people. Seriously, David Hewlett should get at least some recognition, hes a brilliant guy and tallented actor. give the guy a couple more inches, hell, give him 1.125.6 inches to be exact.